Tents used by homeless people on Greenfield’s common have been removed on orders of Mayor William F. Martin. 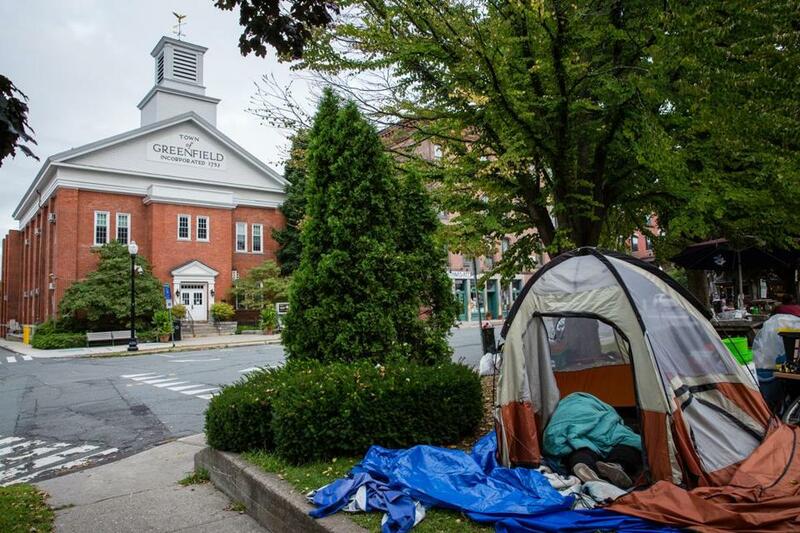 A group of about 20 homeless people who had camped out on Greenfield’s common for several weeks left their temporary tent town by Friday morning after the city’s mayor abruptly issued a surprise order barring everyone from the public green. Sarah Ahern, a recovery coach who works in the historic mill city in northwestern Massachusetts, was one of a group of protesters who condemned the order and stood on the common holding signs Friday. After weeks of talk about a mid-September deadline to close the tent town, Martin announced his decision on Wednesday morning, despite the fact that not all of the tenters had secured long-term housing. They scrambled for two days and were gone from the green by 8 a.m. Friday. Circles of dead grass where their tents once stood were left behind. His announcement surprised city officials, including Police Chief Robert Haigh and City Council President Karen “Rudy” Renaud, who both said they heard Wednesday morning of the pending deadline. Martin said he made an executive decision after an emergency city council meeting Tuesday night failed to reach a resolution about the tent town. Martin has been working to repurpose a building once used for a mental health program, a project that involves state funding and help from nearby nonprofits. He estimated that repairs to the building, vacant since January, should be finished around Sept. 5, and the building could serve around 16 people. He did not provide a clear answer as to what the former tenters would do in the interim. Some former tenters have found long-term placement. Alongside her fiance, the self-appointed leader of the encampment, Madelynn Malloy, 40, got a bed at a Greenfield shelter on Monday afternoon. Captain Scott Peabody of the Salvation Army drove others to Chiz’s Heart Street, a shelter in Kingston, N.Y. Despite the mayor’s assertion that all of the people had found housing, some planned to spend Friday in the woods, said Tamisha Matos, 29, who is diabetic and five months pregnant. “I don’t have a place to stay,” said former tenter Skyla Qualters, 18, in a text message Friday. Qualters does not have a tent, so cannot stay with her former neighbors in the woods, she said. Others will spend a few nights on couches of already-crowded Greenfield shelters, which offered the former tenters temporary emergency placement. Like many homeless or formerly homeless people in Greenfield, Sheridan has camped in the woods in the past, including on the mayor’s personal property, she said. Affordable housing has historically been a major issue in Greenfield, the seat of Franklin County, the most rural county in Massachusetts. Shelters have monthslong waiting lists, and many say that disability payments or Section 8 housing vouchers are insufficient to cover rising rents. “I’m on the streets if I’m discharged before Sept. 1,” said Ron Harding, 51, who left the common for the hospital after developing life-threatening skin infections in both legs. Harding, who has attempted suicide several times and struggles with post-traumatic stress disorder, said he gets $1,300 in disability each month. He intends to use most of that money to stay in a motel. After news of the deadline spread, community members have made efforts to show their support and gathered near the common for a candlelight vigil Friday night. Kirsten Levitt, the organizer of a large free dinner scheduled for Sunday known as the Harvest Supper, said they would honor the encampment and its residents at the event.